I had visited US for a month in Sep-Oct.’ 11. This was my first US visit.I went via Dubai and and landed at Los Angles Airport on 24rd Sept’11. Santa Ana is about 45 Mins drive from LA. As soon I reached to hotel I decided to get some grocerry as I my room has the attached kitchen. I went to nearby Target(Shop like Big Bazar) and somehow forgot that I am not in India and bought lots of things, which I realized after doing the billing. At that time I didn’t have any cab no. So, I had to walk with all the things I bought. Just after going back I cooked lunch for me and just crashed. Next day, as It was Sunday so I decided to go Discovey Science Museum. It has some nice science experiments, moving Dino-sour A space lab which was closed. It is good for the kids. 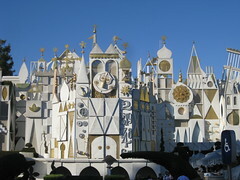 Next Saturday on 1st Oct’11 went to the Disney land which is very near to Santa Ana. Its place to dreams. I saw all the cartoons chacractors to whom I am watching since long time. I tooks some rides watched few 3D shows like Star Wars. 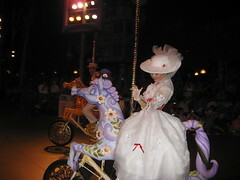 It was the evening parade which I enjoyed the most where all the cartoon char-actors come on the street and peform. The Music, people makes the atmospher perfect. It seems the world is perfect. I would have enjoyed more if had some company.Other than this I enjoyed the Its a small world ride where you the glimse of all the culture of differernt countries of the world. Next Satrurday on 8th I was planning to go LA to see the Hollywood and Universal Studio but Remington, my co-worker at STEC told me that there is Formula Drift happening near by and asked me if I wanted to join.I thought about it and decided to go to Formula Drift as may be next time when I go there, it would not be scheduled during my stay but places at LA will stay at same place.. :). It was one of the Unique experience I had . There were cars from different companies for display, kiosks from major vendors, fancy bikes. etc. 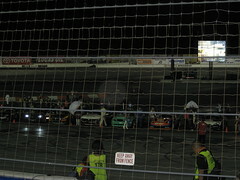 The drifting was there real fun. The sound, the smoke, the race. I also came to know that one of cousin stays very near by whom I did not meet till now. So I went to visit him next day. By this time I had some friendship with few Indians working in our US office. One of them was Rangasai. We used to same chat during or post Lunch. 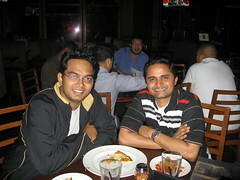 Next Friday on 14th Oct I went Yard House with him and had some great time. Then we went to his place.This weekend I had to work so did not get enough time go out of city. Though on Sunday I went out for a movie with Remington and then we joined some of his friends in thier house. There we played some game with ball and glasses, in which some glasses are kept in front of each player and other player has to throw the balls into them. Player, who puts the balls on each glasses of opposite side wins the game. Glasses are filled with beer and as soon as the ball lands up in glass the player has to drink all the beer of that glass. Initially I lost but later I picked up the game and won. Last week was full work and I didn’t get chance to out even a single day. But on Friday, 21st Oct Rangasai and I had great fun. We listen to Gazals, went for a drive and discussed many interesting things.I also told him about Akshabharati and he even donated some amount. Next day I catched the flight and came back to India on 23rd Oct. Overall I had some great time in US. Learn few things, shared some knowledge, met very senior people. During my stay I missed India, my home very much.